Here it is, the new logo for wamblee.org. 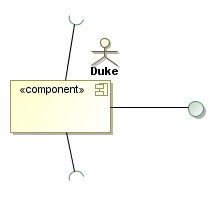 It is Duke is flying like an eagle (wamblee) on a component (a Java component of course). The component has one provided interface and two required interfaces. If you listen carefully, you can hear Duky say “Top of the world!”. The image is a little derived from a component diagram in UML. These are just initial steps as far as the logo is concerned. I found out that I will need to add a skeleton/rig to Duke myself to make it take different postures and do animations but that will come later. One of the first steps will be to improve the image. The current version contains non-smoothed elements that will show when enlarged. Also, someone compared the required interfaces to plungers. To avoid any such confusion I am going to change the end shapes to more abstract geometrical shapes and also work a little on colors and lighting.